PARIS — Satellite fleet operator Intelsat and Canada’s MDA Corp. have scrapped their agreement to collaborate on satellite in-orbit refueling following a lack of commitment from the U.S. government and other prospective government and commercial customers, the two companies said. 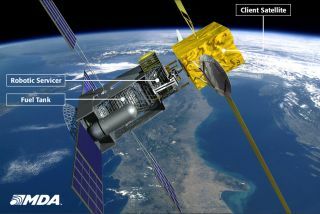 Richmond, British Columbia-based MDA Corp. said it is not wholly abandoning the idea, but will bid, as expected, for an upcoming U.S. government contract calling for proposals on satellite-repair missions. Luxembourg- and Washington-based Intelsat, whose 50-satellite fleet makes it one of the likeliest commercial customers for MDA’s robotic in-orbit servicing expertise, had agreed to invest $280 million in an inaugural mission for MDA’s proposed Space Infrastructure Services (SIS) business, with payment depending on how many Intelsat satellites were successfully refueled. The Intelsat investment had given a boost of credibility to the MDA project and represented the first time that a major satellite operator had given such an endorsement of satellite refueling, an idea that has had many incarnations in the past two decades but has never been pursued to commercial deployment. U.S. Air Force officials had said that while they like the idea, their current satellite fleets are undergoing replacements that have already been financed. In the current budget climate, they said, finding funds for a new program such as in-orbit fueling would be difficult. Meanwhile, the estimated $300 million price tag for planning and conducting a first SIS mission, including the cost of launching the initial servicing module into geostationary transfer orbit, was moving in the wrong direction. Hopeful of getting a U.S. government customer, MDA replaced what had been planned Russian content with U.S. hardware. Whether these concessions ultimately will be enough to win a U.S. government contract for an SIS mission is unclear, but it will be too late for the MDA-Intelsat deal, which as announced in March 2011 had envisioned a 2015 inaugural flight. "We had an agreement that we were going to jointly investigate the concept of the SIS," Intelsat Investor Relations Vice President Dianne J. VanBeber said in a Jan. 16 statement in response to Space News inquiries. "At the completion of the investigation stage, we determined that the project would end. We remain very interested in refueling and SIS, and will continue to explore potential solutions to refueling. It is obviously a complex initiative, and one that requires a marriage of technology and commercial creativity." MDA, in a Jan. 11 statement, said it continues to "pursue opportunities in this area," including a U.S. government Broad Agency Announcement, now expected in February. As for the agreement with Intelsat, it has “ceased to be in effect,” MDA said.